 SiteSpinner supports several image file formats including PNG, JPG, GIF and BMP. 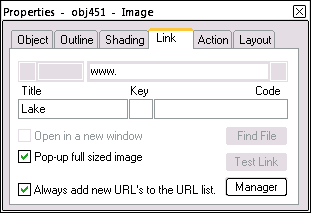 To use an image on your page, select the Mona Lisa button on the Tools (left) toolbar, or select the Image command in the Object menu. This will open the standard File Open Dialog. Navigate to the folder that holds the image you wish to use, select it and click Open. The image will be displayed at its full size in the center of your screen.  When SiteSpinner creates images it can do so in a number of image formats. Set the default type of image that SiteSpinner creates from the Project Options > General Tab -- we suggest you set it to suit the kind of image that SiteSpinner most often creates for your project. Use JPG for photos and PNG 8 or PNG for anything else. PNG is the default setting. It is actually PNG 24 which means that it provides 24-bit color in three color channels, Red, Blue and Green with each having 256 levels of brightness. It gives good results for all image types, but can result in large image file sizes -- particularly for photos. PNG 8 operates on a palette restricted to 256 discrete colors -- which can be any of the PNG colors. It usually gives the best results for the smallest file size. We used PNG 8 for many of the images in these tutorials. If in preview, you see color banding like that just showing below, that is an indication that you need more than 256 colors -- select another format. PNG 32 supports 256 levels of transparency. Because the file size of PNG 32 is larger than for the other PNG types. We suggest you don't set that format as your project default. 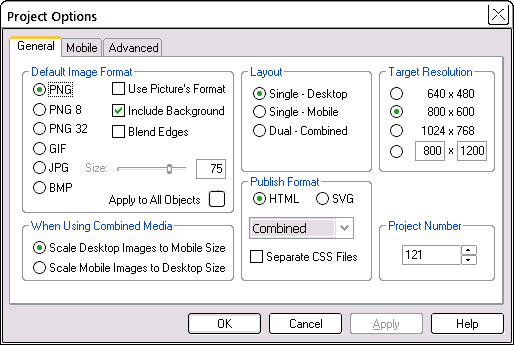 Rather, set PNG 8 or PNG as the project default and use the Geometry Editor > Options tab settings to change the format for particular images. PNG 32 example. GIF is an older image format, again 256 colors, comparable to PNG 8. Generally, PNG 8 is superior, but there are some types of image, particularly small ones with just a few colors, where GIF will give a smaller file size. GIF is the only image format that supports animation. JPG format is best for photos, but also gives good results for other images involving text and lines at higher quality settings. If you reduce the quality setting too much. your image will take on a spotty appearance around the edges. We did the example Title on the left at 20% quality -- too low. BMP Don't use BMP format without special reason. It gives excellent results, but with a very large file size. Use Picture's Format. Where you are creating, say, thumbnails from source images, the thumbnails will be the same types as the source. If your photos are JPG, the thumbnails will be JPG. If your other source images are GIF, your processed images will also be GIF. We suggest you check this box. the background in a re-rendered image. Size (JPG only) This is also an image quality reduction. Reducing the quality of the JPG image will reduce the file size of the image -- always desirable on a web page. Reduce this setting to a point just enough to keep your image quality acceptable. At this point the image file size will be as small as you can reasonably make it. Click this button to have SiteSpinner apply the current image format to all objects that already exist in your project. select the Geometry Editor > Options tab > Rendering File Format. There you will find the same settings overriding the Project Options settings for that one image. A thumbnail is scaled down version of a larger image. The idea behind this is that the thumbnails, being small, will load a lot more quickly than the larger images. The intention is to download the large images only to those visitors who click on the thumbnails. So the page is faster for everybody else. You can also enter new scale values into the Quick Editor. Preview with the single > preview button, or by pressing the F7 function key. The image of the arrow will be re-rendered at the smaller size. When you publish, this smaller image will be transferred to your web site. A series of these small images can form the basis of a thumbnail gallery. Now let's look at creating a link to the full-sized version of the image. Let's start with an actual larger photo of the sort you might include in an image gallery. 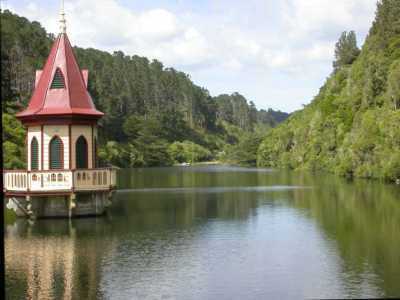 First make the thumbnail as before (this image is also in the ClipArt folder, and is called "Lake.jpg"). To create a link from the thumbnail to the original image, go to the Quick Editor > Link tab. Check the Pop-up full sized image check box. The image above shows this. 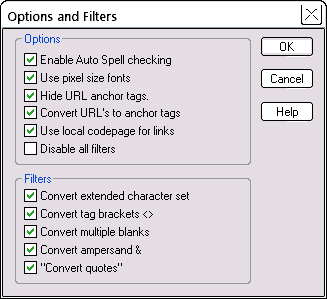 There is a similar option on the right-click context menu. Now preview and click the thumbnail image. The original image will open in a new popup window. If you use the Gather option when you publish, the original image will be uploaded to your site automatically (along with the thumbnail which will be uploaded anyway). Select the first image of a group, then select the last image of a group while holding down the Shift key. All the intervening files will be selected too. With the full-size images stacked on your workpage, select all of them with a marquee selection. Now you can scale all at once by dragging, or by entering scale values into the Quick Editor > Object tab. JPG format is by far the best choice for photos. Likewise, thumbnails of photos also work best in JPG format. By contrast, line drawings and text may well be better in PNG or GIF. Set up the project image formats to take care of your most common re-rendered image. See also: Tables for photo galleries. Click on the red arrow to select it ready for rotation or skew. Use the Reset Button in the Quick Editor to restore the arrow to its original state. 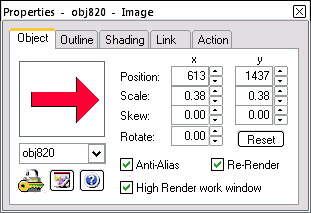 In the Geometry Editor > Options tab, set Render Background on. Don't place a "transparent" object over a text object since it can produce misalignments when publishing -- you can't guarantee the exact location where text, after the first character, will appear on your published page. Title objects are OK, creating fixed image files, but in text objects, text size and font are very much under the control of your visitor's browser. PNG 32 image format is the one exception to all this -- you can use it anywhere -- covered further below. The two images on the left are clones of each other, in PNG format, and use the same image file. One is placed on top of the text, and looks fine on the workpage although in preview or published form the misalignment may be showing -- depending on your browser. The one in the margin is an exact replica of the one in the text. In preview, you can drag both of those "transparent" objects with your mouse, and confirm that the transparency is faked -- they are "transparent" only while in a particular place. PNG 32: This uses a fourth color channel, similar to the normal Red, Blue and Green, that gives varying levels of transparency from fully transparent to fully opaque. These have a two-pixel non-transparent border, just so you can see where they are. You can easily remove the borders via the Quick Editor > Outline tab > and setting the Thick(ness) to 0. Another interesting property of these rectangles is that they can carry a Link or an "alt tag" -- called a "Title" in the link editor. We have added titles to the rectangles here. These rectangles can be useful when making buttons -- you can have an invisible layer on top of a button that carries the link. Or maybe make a secret door to another page -- there's one near here on this page -- can you find it? PNG 32 supports 256 levels of transparency. We showed a PNG 32 rectangle above with a fully transparent body. Here is another using the graduations of transparency. It looks similar to the transparencies just above, but the big difference is when the image shifts over its background. In preview, try dragging the image. There is another category of transparent rectangle that your browser can build entirely out of HTML code. This means compared to other rectangles, no image file is required. To make such rectangles, use the Quick Editor > Object tab to set Anti-Alias and Re-render both off. This forces SiteSpinner, if it can, to do without an image file. Therefore SiteSpinner won't allow borders of more than two pixels -- if you try, it will produce a rendered rectangle (image file). Transparency does not always give perfect results. When you specify anti-alias, and also no background, SiteSpinner anti-aliases the image against the page background color which is usually white. Under these conditions, may see a white halo around the image when you place it against a new darker background. Sometimes you may like this effect, but if you don't, try the Blend Edges option in the Geometry Editor > Options tab. SiteSpinner will then anti-alias the edge against the actual background of the image as it appears on your workpage. In preview for the images below, this change has an obvious effect where the white halo on the left-hand rectangle without Blended Edges is missing from the right-hand rectangle. If you drag a image file that contains true transparency (PNG 8 or GIF) into SiteSpinner, the transparency will be maintained in the workpage. 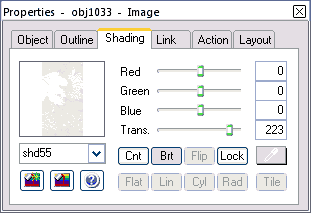 If you copy and paste (or select and drag) from an image editing program, the transparency will probably be lost, because Windows sends images to and from the Windows clipboard as bitmaps, which don't allow transparency. Use transparency mapping to make a color transparent after importing. Changes are applied only to a re-rendered version of the image. The original image is not affected. A rotated or skewed image may display significant aliasing (jagged edges) depending upon the angle you rotate it to. Minimize this by enabling Anti-Alias. You can see the effect of anti-aliasing in the workpage if the High Render option is enabled, but this may cause screen updates to appear sluggish with a complex project or a slow computer. Anti-aliasing cannot repair an image that already displays aliasing. A watermark is a pale image placed on a page as a background. You can make any image paler by putting it on a white background and setting transparency. Because they are so pale, these images will withstand a modest degree of scaling up before noticeable deterioration in quality. The image on the left is the source image for the watermark on the right. You'll find it in the ClipArt folder. To embed an image in text, insert the code line just above as normal text. Specify your image source (folder and file name) with single inverted commas. The alt attribute is optional, but we recommend that you put it in. In order for this to work in preview, you need the image to be in your preview folder, or in an image folder of your preview folder. See Adding Files to the preview folder. To get the image into your publish folder, you could use an embedded object via Embed File or Media. The way we did it though was to include the image once somewhere in the project as a regular image -- see left. This puts it into the normal /image folder on your site, where the special code can also access it. The other way is to use a separate FTP program to do the copy.